Cupcakes 'n Daisies: Seeing Red . . . .
Have you seen the September/October issue of McCall's Quilting? What do you think of that Dresden quilt on the cover? I love it! What a great idea, to use red as the background fabric for those blocks. I really like the contrast between the light floral prints and that fantastic red. Don't like red? You could use any color as a background I suppose, blue, green, whatever suits your fancy. But you know me and I fancy red!! Not only do I love the red background, I love the three different sizes of plates. I don't have much in the way of floral fabric with a light background. Almost all the fabric in my stash has a colored background. This will require some shopping. The pattern is called Dresden Doilies and is designed by Gerri Robinson. (there's a kit available on her website, Planted Seeds Designs) She has a pattern in almost every McCalls Quilting magazine. My Red White and Wonderful quilt was a Gerri Robinson pattern. This quilt finishes at around 60" x 60", what a nice size. The instructions provided by Gerri call for glueing the plates and center circles to the background fabric then quilting. I'm not so sure about that, have you ever tried such a thing? Wouldn't that center circle ravel over time if the edges weren't turned down? Even if I have to hand stitch those plates and center circles on, I still love this quilt. It's been ages since I saw a pattern in a quilt magazine that I liked well enough to tear out and file in my pattern binder. I was just about ready to let this subscription expire, I may have to hang on a little longer. 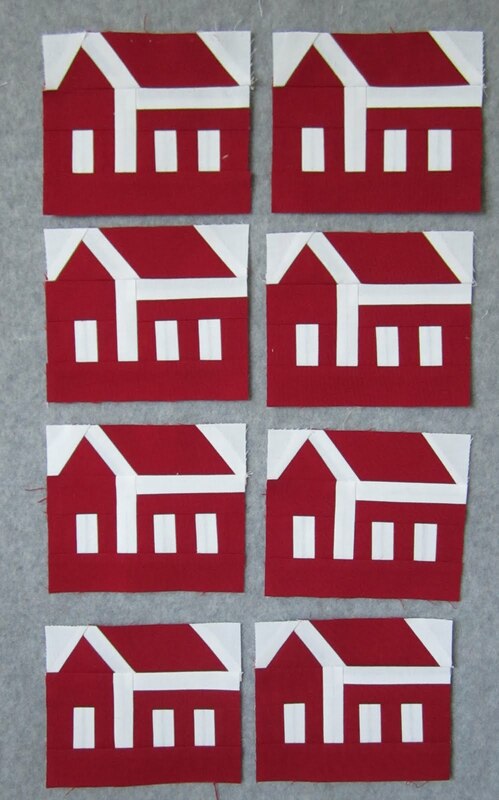 So I'm working on this Red and White Tribute Quilt, and I thought some little red school houses would look good so I sat down with my pencil and paper, did some cyphering, and came up with a plan for making 4 1/2 inch blocks. Up until this point, the math part of this project has been one of the things that I've really enjoyed. I had no problems whatsoever with the main structure of the school house, but that roof line was another matter entirely. This was probably my worst attempt . .
Now this is one perfect roof. Trouble is, it took me NINE attempts before I got that perfect roof. The first roof I actually tried to piece using templates that I made, not even close! I then figured I would "just draw" the roof and paper piece it. The second roof, how did that happen!! My first lesson in mirror imaging when drawing a pattern to be paper pieced. I guess I could have made all the houses facing west instead of east, but I've NEVER seen them that way in a quilt so I figured I better draw the roof backwards. The problem was getting that white diagonal strip to match perfectly with the white horizontal strip in the house. Now it's down to a few more blocks and a few chimneys and I'll be good to go. I'm thinking you'll see a finished school house quilt this week, stop back by. Note to Ann from basket blog - basket blocks with corner triangles finished at 11 1/2 inches! Oh, dear. I wish you hadn't shared this. I've been thinking about a Dresden quilt for ages. Even bought the tool. This one is gorgeous. I'm thinking that this could be a long-term project -- make the plates when it snows in January and February, get it all basted together in the spring, and then in the summer during the Olympics and political conventions, do the hand stitching. Hehe :D Poor Thelma will have to do some shopping. ;D You're right - that dresden quilt is marvelous! I have been thinking of making a house quilt - but after your 9 attempts at a roof, I might stick to baskets and log cabins! the end results look SUPER, Thelma! Oh, I think that I definitely need a copy of that magazine. I'm not a hand appliquer at all, but I love me that quilt. And I feel your pain on the reverse thing - my brain definitely doesn't like reverse at all. I try, think I have it, and still mess it up! UGH! But your end result is perfect! Wow! What persistence! And here I was mad at myself for having to re-do a pp pattern one! 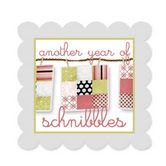 lol Your houses are going to be wonderful~ and I lalala-love the dresden quilt!! I can't wait for my issue to arrive!! Have a happy day! Super cute houses! The dresden plate is so simple, but I sure never thought of it! McCalls seems to have at least one good quilt per issue, so I keep it coming to my house. Quilt mags are cheap entertainment, in my book, and it is still fun to get mail! Enjoy fabric shopping...one of my favorite parts of a new project! Love the little red school houses...adorable! 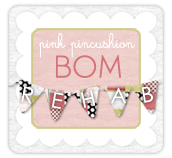 Thelma-- never commented on your blog before...but I never miss reading a post...I love your work and your positive attitude! I will definitely be buying the Sept. McCalls...LOVE the dresden quilt. This would be a fun quilt along, no? Oh, what a great Dresden that is. I will just have to go out and buy that magazine. I have made two dresden quilts but for other people but this one I think I would make for me. Thanks. I love the Dresden plate quilt with the red backing. I'm partial to red and white quilts. Wish I could have attended the exhibition with all the red and white quilts. I'm trying to build my stash of red fabrics. I love th dresden quilt too! I would do mine in red too! 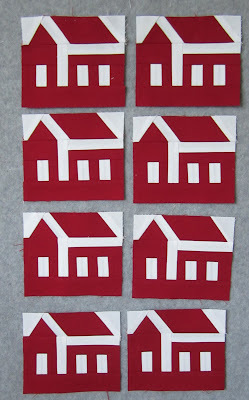 Your house blocks are going to be perfect for your quilt! I've never paper pieced before. You're so inspiring with how you try new methods all the time. I can't wait to see how your red and white quilt ends up! I love the dresden quilt! I'm going to have to go grab that magazine. I like that quilt too; it really does look like doilies done in that color combo. The gluing part doesn't sound too good to me either, though.